This is truly an amazing time to be at UB. Clearly, we’ve been very busy! And I know this continues to be a very busy time for all of us. 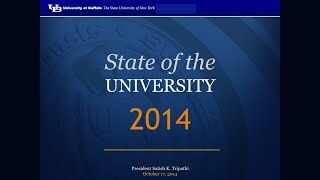 So I thank you for taking time to join me for the third annual State of the University address. And our regional, civic, health science, and business partners. It’s sometimes hard to believe I’ve been president for over three years now . . . and that ten years have passed since I first joined the UB community as Provost. Reflecting back, I am proud at what we have achieved together in just this short time. When I came to UB in 2004, I saw a very fine institution with a solid foundation, and great potential. But today I see a remarkable institution—a world-class university taking its rightful place alongside some of the best research universities anywhere. Truly, UB has transformed—and continues to transform. And that is because of all of you—our staff, faculty, students, alumni, university friends, and partners in the community. Recently, we had an opportunity to reflect back on this decade of progress as part of our university’s ten-year reaccreditation review. It may take a village to raise a child, but it takes an entire university community to prepare for an undertaking like this! For more than two years, hundreds of our faculty, staff, and students contributed their energy, expertise and insights to this effort. Throughout this process, one theme consistently emerged—that the past decade has been a period of great institutional transformation. We have made great strides forward—even in an era of significant budget constraints and other national challenges for higher education. And I think we all can draw inspiration from our success, and from the visible impact it is having. We have set an ambitious course for ourselves. We have accomplished a great deal. And we have much more yet to achieve. Every day, we are realizing the fruits of UB 2020. And we are using this momentum as a springboard to launch our vision forward. Over the past few years, we have been implementing a well-honed strategy for leveraging and enhancing our distinctiveness. Because of you, we are a leading national research university, with a global reputation. This is not just a vision, it is our reality. And we live it every day. We are a great university. But great universities don’t stand still. Every day we must set our sights higher—for the sake of our students, our communities, and the world around us. That is the heart of our mission as a public research university. It is the guiding principle that has driven UB 2020 from the beginning. And it drives all our work now as we continue to realize our aspirations. It’s why we are designing a comprehensive general education program that will prepare our students to be thoughtful, globally minded leaders. It’s why we are defining interdisciplinary communities of excellence to maximize our scholarly capacity to tackle the great questions and challenges of the 21st century. It’s why we are building on our long tradition of excellence in the arts, humanities, and social justice. It’s why we are launching vast new research initiatives that harness the life-changing discoveries of our faculty and translate them into powerful impact: from a pioneering genomic research center; to breakthroughs in structural biology building on the work of Nobel laureate Herb Hauptman; to new advances in women’s health that are changing the face of medical care. Let me begin to answer these questions by providing a few proof points. When registering for this event, several of you asked about hiring and the research enterprise, so I’ll start there. This past academic year, we hired 110 new faculty and 157 new staff, who provide critical support to our academic enterprise. Our total research funding—including all sources—is now at an all-time high of $388 million annually. UB’s faculty research productivity is well above the national public research university average. Our faculty and staff continue to earn international acclaim for their work. In just the past few months, they have received major honors, from NSF career awards to Guggenheim and Fulbright fellowships. They’ve been elected as fellows of the most prestigious scholarly associations in their fields, including AAAS, the APA, and the American Academy of Nursing. In the past five years, UB has had the lion’s share of all new appointments to the SUNY Distinguished Ranks—the highest faculty rank accorded by the system. Just last week, we honored some of our outstanding faculty and staff—and their vital contributions—at our annual fall Celebration of Academic Excellence. And I see many of you are with us today. We know that the world’s best faculty attract the world’s best students. And this year, we have seen record enrollment. We are recruiting more of the very best undergraduate, graduate, and professional students across our state, nation, and world. These are intellectually passionate, motivated students who know they want to use their talents to make a difference in the world. And they come to UB because they know they will find opportunities here that will challenge them to do just that, to the very best of their abilities. UB provides our students with distinctive opportunities, including hands-on experience in clinical and research settings, working directly with world-class faculty. Through your vision and hard work, we have implemented several initiatives to bring the research enterprise closer to our undergraduate students. These include: Discovery Seminars, the Academies, the Honors College, and expanded opportunities to gain valuable global experience. So, how do we know our investments in the undergraduate experience are working? The most important indication is what our students are achieving. I am constantly amazed when I talk to our students about what they’ve gained from these programs. Like some of our mechanical engineering students who have had the chance to test their designs in NASA’s near-zero gravity facilities, or the environmental science students who spent their winter break helping to restore wetlands on the Louisiana coast, or the anthropology and biomedical students who led a health-and-human services delegation to Honduras. And increasingly, their work is attracting international acclaim. More and more students are competing for major national/international awards, such as Marshall, Fulbright, and NSF fellowships. Everywhere I go, I like to tell people that we have some of the world’s best students at UB. And that’s because of the active learning environment you have created. I proudly note that UB’s graduation rates are among the highest in the nation among public universities. And that is because of the exceptional programs we provide our students. Some of you asked about student support and success, and I want to mention some of the significant investments we have made in this regard. A prime example is the Finish in Four program, through which faculty and academic advisors work with students to ensure they graduate on time. Our staff provide exceptional support for our students. And we have seen visible outcomes. It’s still too early to assess graduation rates resulting from the Finish in Four program. But within the first two cohorts we are already seeing significant impact in the form of higher GPAs, better academic standing, and improved freshman retention. And students are participating in record numbers. This is a credit to everyone involved—from staff in our financial aid and Registrar’s offices, to IT, libraries, and student support. As you know, some of the most visible transformations taking place at UB are the great changes to our physical environment. We continue to make major investments in our educational and research facilities, and in the infrastructure that supports our three campuses—North, South, and Downtown. We’ve opened six new state-of-the-art buildings on our three campus centers in the past three years. We are moving forward with longer-term restoration of our historic South Campus to reclaim the original vision laid out by E.B. Green. And downtown, cranes are in the air as we build a new home for the medical school, which will be part of a world-class Academic Health Center anchoring the Buffalo Niagara Medical Campus. Collectively, all this progress has an impact far beyond our campus borders. We are not just transforming our university. We are transforming our larger communities—regionally and globally. That’s why engaging more deeply with our communities—near and far—is a key priority. And every day, we see the impact of this engagement. For instance, some of you asked about how UB is partnering with Buffalo’s K-12 schools to improve educational outcomes in our region. One powerful example is the impact of the Interdisciplinary Science and Engineering Program over the past decade. UB—partnering with the Buffalo Public Schools, Buffalo State College, and other organizations—is transforming science education throughout the district. Local educators, parents, and students remark that as a result of this program, our region’s young people are getting excited about science, both as a discipline and as a potential career path. Our alumni, near and far, are also watching very closely what is happening at UB and in Buffalo. Our Beijing graduates tell me they start the day by reading the Buffalo News. And at our Larkinville event this September, our Buffalo alumni were buzzing with excitement about what is happening in our great city, and about the leading role UB is taking in the region’s transformation. Here in Buffalo, across the country, and around the world, our alumni and friends want to become more engaged and connected to what’s happening at UB. They want us to bring more of our grads to their businesses. They want to be part of the university’s present and future. And they are doing just that. These are all important measures that tell us we are on the right track. I am pleased to say that this year, we have created an annual progress report. This report highlights some the exciting discoveries, contributions, and accomplishments our university community has made over the past year. And as you already know, it’s our people who bring these facts and figures to life. Our federal research expenditures are impressive. But what really brings this home are stories that paint the picture of how our faculty and graduate students are using that grant support—To do things like: build an underwater Internet that will transform the way we communicate… and develop pioneering therapies that will change the way we treat cancer. Our students’ growing list of major national awards is impressive in itself. But to understand their full significance, you need to know what our students are doing with this support—like launching an international blog that raises awareness of human rights issues, and sending a new Mars Rover into outer space. Stories like these highlight the impact of our university. And I believe very strongly that our impact is the very best measure of our excellence. This is how we know we are achieving our mission to the fullest. The proof is that our faculty, staff, and students are changing our world for the better, every day. As one shining example of that impact, just look at the changes taking place in our own City of Buffalo. This is an exciting time to be in Buffalo Niagara. I believe UB is a big part of the reason why. Right now in Western New York, we are seeing many spheres coming into alignment. Progress is moving forward in many major sectors—including: health care and life sciences, advanced manufacturing, arts and culture, and information technology. This progress is focusing national attention on the university, Buffalo, and our region. None of this happened by chance. Our UB 2020 vision has positioned our university and our region at the forefront of major national trends in health care, the arts, and business and industry. The result: When great opportunities arise—like the creation of the Regional Economic Council and Buffalo Billion—Western New York is able to hit the ground running. As one key outcome, our students and graduates are finding great professional opportunities right here in our region. Let me give you just a few examples of what I mean. Earlier, I mentioned our new medical school building, which will propel UB to the forefront of medical education, patient care, and translational research. It is already creating tremendous opportunities for: our students, our graduates, our faculty, and our region. The area of genomic research and personalized medicine is another prime example of how our strategic vision has positioned UB and Buffalo to seize incredible opportunities. Last spring, Governor Cuomo announced a transformative investment creating the new Buffalo Institute for Genomics. This UB institute has the potential to revolutionize the treatment of serious disease—including cancer, diabetes, and M.S. And the leadership of our faculty and graduates puts our university and our region at the vanguard of this critical field. Another key example is our progress in the areas of materials informatics and advanced manufacturing. This field has wide applications, from national security to creating replacements for depleted natural resources. UB’s considerable faculty strength in this area, and our supercomputing resources, are positioning our region as a national leader in this field. UB is also pleased to take a leadership role as part of the Governor’s START-UP NY program. This program has significant connections to our academic enterprise—from new internship and entrepreneurship opportunities for our students;to more jobs that attract global talent to our region and create new professional avenues for our graduates; new pathways for our faculty to lend their expertise to industrial research and development, and new partnerships emerging as these companies tap into UB resources like the Center for Entrepreneurial Leadership in the School of Management. Great cities have thriving arts and cultural scenes, and Buffalo is nationally known as a leading arts destination. Again, UB’s role as a cultural magnet is a big part of this. Our renowned faculty in the visual and performing arts draw attention to Buffalo as a major hub for the arts. And our students and recent graduates in the arts are also making a name for themselves—from Hallwalls to Broadway. What I’ve tried to do today is paint a picture, in broad strokes, of the progress we are making across the university, and the many ways it is transforming our communities—locally and globally. This is not to say we don’t have our challenges. We do, like every university in the nation. Public investment in higher education continues to dwindle. At the same time, public higher education is asked to do more and more. With this dis-investment in higher education, we are challenged to find the resources we need: to address an aging infrastructure on our North and South Campuses, to support our ambitious faculty hiring goals, and to provide more scholarships for students in need. Despite this strain on our resources, we continue to bring more of the best faculty and students to UB. This is tremendously important, and it is a key contributor to our growing stature. At the same time, this has given rise to a new challenge: as we grow better and better, we are increasingly competing with the world’s best institutions for these outstanding faculty and students. This makes it imperative that we continue to enhance the distinctive strengths that set us apart from other great universities. Finally, even as we explore new avenues for distinguishing ourselves and expanding our impact, we must do so in a way that is consistent with our academic mission. We must balance new expectations for our economic and societal impact, while staying true to our core mandate. We will always face challenges. That is simply a fact of life, even for the very best universities. And we will overcome these challenges, just as we always have. That is what great universities do: We acknowledge and confront obstacles head-on. We draw on our distinctive strengths to overcome them. We position ourselves to be even stronger and more nimble in the future. And to sustain our upward trajectory, we must continually demonstrate the value of public higher education to all of our constituencies. As I said earlier, I am a firm believer that great universities don’t stand still. So we must ask ourselves, what do we need to do to become even better—for the sake of our students, our faculty, our communities, and our world? How should we direct our next steps? Where do we envision that path leading us, and how do we ensure it is fully aligned with our mission? Our university community is actively addressing exactly these questions right now. For example, many of you are engaged in re-imagining the general education curriculum, with a focus on experiential learning and global perspectives. This is a massive undertaking involving the work of nearly 100 faculty, staff, and students. With this new curriculum, once again we are actively bringing our students’ liberal arts education closer to the research enterprise. We will be connecting the gen ed curriculum to our 5 big research themes—Humanity, Justice, Innovation, Environment, and Health—in order to encourage our students to look at the world and its challenges through a multidisciplinary lens. We believe this will prepare our students to be active drivers in knowledge creation—to break ground into uncharted territory. Our students will be the next generation of global leaders, shaping the future of their fields. Our students, right now,are already expanding our understanding of indigenous cultures, pre-historic life, and the cosmos. Just imagine what new frontiers the world will know in the future because of their exploration of the unknown. We are taking the interdisciplinary research paradigm that began with the Strategic Strengths, and launching it to the next level through the development of Communities of Excellence. These are multidisciplinary scholarly communities focused on large-scale societal challenges. Last year, we introduced RENEW as a model for these communities, in the area of energy and the environment. Over the past year, our faculty and staff across the disciplines have been engaged in developing proposals for other innovative, high-impact scholarly communities. What is so exciting is that our faculty are already: defining new genres of music, engineering the world’s safest bridges, and shaping educational policy nationally and abroad. Just imagine what UB can do when we enhance our scholarly framework to catapult their research and creativity to the next level. We have been pushing steadily in this direction for the past decade. And now we are on the brink of fully realizing our most ambitious aspirations for our university. We are on the brink of a new future for our region as UB plays a vital role in Buffalo’s resurgence. We will make Buffalo a national model for how to transform a Rust Belt region into a vibrant, world-class destination. We are on the brink of developing life-saving cures for some of the world’s most critical health care challenges. We will revolutionize treatment for the most insidious disease. We are on the brink of realizing real change in our nation’s schools, through our faculty’s leadership in the area of bullying and school violence. We will ensure that every student can go to school ready to learn and thrive in a safe, non-threatening environment. We are on the brink of major progress in mitigating climate change, by changing how we use energy and precious natural resources. We will build a more sustainable future for our globe. And this is just the beginning. A decade ago, we imagined a new future for UB as a world-class research university, at the heart of a revitalized Buffalo, and at the forefront of discovery, creativity, and innovation worldwide. Now, we have arrived at this future. And we should pause and celebrate all that we have built together. But let’s not stop here. Together, we must always be envisioning where we want to be a decade from now; and a generation from now. This is truly an exciting time to be at UB. You are what makes the University at Buffalo a great university for the 21st century.